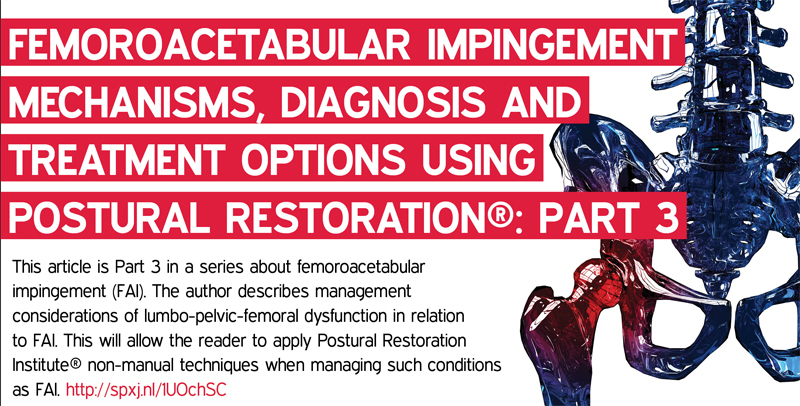 This is the third article in the series on the management of femoroacetabular impingement (FAI) using Postural Restoration techniques. In this article I propose a method of managing FAI using Postural Restoration Techniques. In the first article in this series I explained the biomechanics of lumbo-pelvic-femoral dysfunction as it relates to femoroacetabular impingement (FAI) and as understood by the Postural Restoration Institute and in the second article I propose biomechanical mechanisms and rationale for both CAM and pincer types of FAI. Jason Masek MA, PT ATC CSCS PRC completed his degree in Physical Therapy from Des Moines University-Osteopathic Medical Center in Des Moines, Iowa, USA. He received his athletic training experience from the University of Nebraska-Lincoln and the University of Minnesota. Jason currently practices at the Hruska Clinic™ Restorative Physical Therapy Services in Lincoln, Nebraska, USA. Jason has developed a strong background in sports medicine and athletic injuries with an emphasis in manual physical therapy. He is a member of the National Athletic Trainers Association, the National Strength & Conditioning Association. Jason has earned the designation of Postural Restoration Certified (PRC) as a result of advanced training, extraordinary interest and devotion to the science of postural adaptation, asymmetrical patterns and the influence of polyarticular chains of muscles on the human body as defined by the Postural Restoration Institute® in Lincoln, Nebraska, USA. Have we lost the opportunity to create a reputable brand?